Samsung announced the Samsung Galaxy Mega, a device that combines the portability and convenience of a smartphone with the power, multitasking capabilities and extensive viewing experience of a tablet. The newest addition to the Galaxy family balances an optimal viewing experience on a 6.3” HD screen, yet is ultra-thin and portable enough to put into a pocket or hold in one hand. 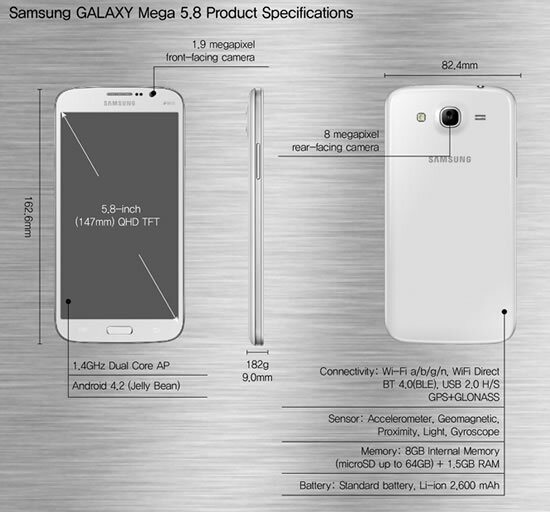 For users seeking the same great tablet features with even more portability, Samsung is introducing the Galaxy Mega 5.8. This is more compact version features a 5.8” screen. Both Galaxy Mega 6.3 and 5.8 run on the latest Android 4.2 Jelly Bean experience, and feature Dual Core Processor, spacious internal storage along with up to 64GB of expandable memory to store favorite apps, music, videos, photos and more. The devices’ advanced software also facilitates more efficient processor use for improved battery life, meaning users can enjoy longer talk time and multimedia use. 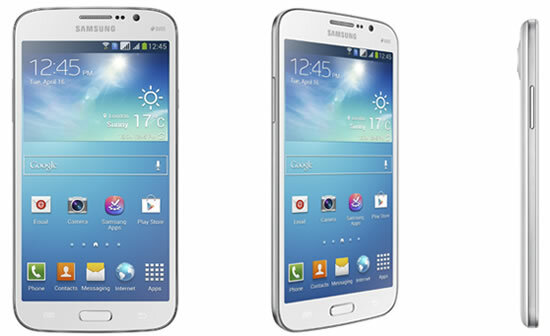 The Samsung Galaxy Mega is also light and thin for incredible portability and easy, convenient mobile phone use. Customers can stay connected with a variety of new phone features. The Galaxy Mega is equipped with an enhanced 8 megapixel rear-facing camera with a 1.9 megapixel front-facing camera, along with a variety of camera modes. 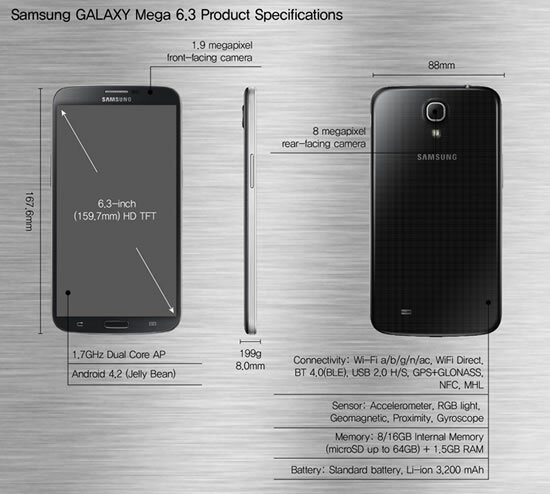 The Galaxy Mega will be available globally beginning May from Europe and Russia. The product availability varies by market and will be rolled out gradually.